I Burn For You, which version? As anyone who owns the Bring On The Night double-CD knows, its version of "I Burn For You" is nothing like the version they use for the movie documentary. Omar Hakim ends the song in the movie with a transcendent drum solo, while the CD version never really takes off. Does anyone know which one is in the box set? Pre-order through Amazon. Use your points. Will be great to have all my favorite songs on just 3 CDs. 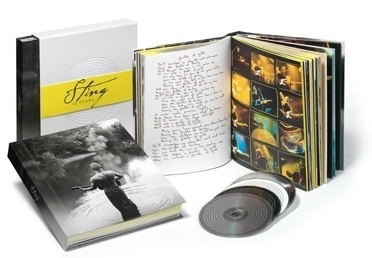 So glad this is on the list #8 (I Burn For You)....Cannot wait for Sting's countdown and my own personal countdown....This song was dedicated to my "first kiss" when I was 16 and was living in Santiago, Chile for one summer. Recently I connected with "my first kiss" and we are seeing each other for the first time Sept 29! Now we have 2 reasons for our countdown! ...and no one else has more right to determine what ought to be on it, and what he has picked is a solid running order. Nonetheless, I second Marcelaeg's wish that he had given stronger consideration to more standout non-album tracks like UNTIL, EVERYBODY LAUGHED BUT YOU (available in the U.S. only as a B-Side), LULLABY TO AN ANXIOUS CHILD, or ANGEL EYES, or even some of the instrumental work from THE LIVING SEA. Most of us have these anyway, but remastered versions would have been welcome - and these songs would have been made accessible to a wider audience. Never mind all this regurgutataed old material. When are we going to get a new album? Is Sting in competition with Elton John to see who can re-release their back catalogue in as many different ways as possible? Not impressed! Oh, what a great idea to release a box set with the same old songs we have been listening for years and ask fans to pay for Englishman in New York again. Writting new songs after 8 years is asking for too much? It will compliment my collection beautifully. Is the IP sweat in HD! Very much looking forward to seeing the IP footage. Is the sweat in HD! no chance to get the live without the box ?